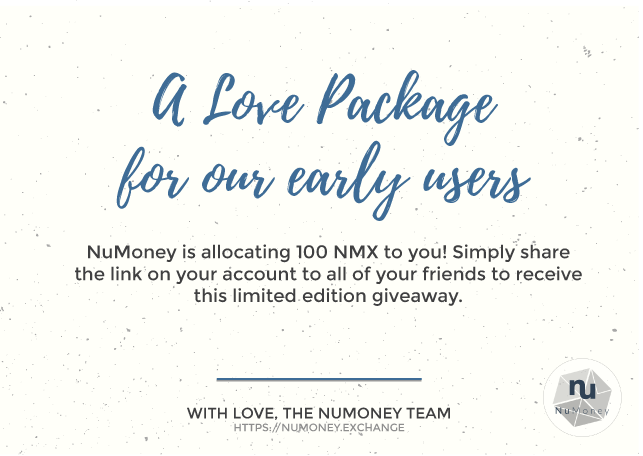 NuMoney is giving out 100 NMX tokens for all our early users! Yes, that’s right, it is time to share the joy with your buddies! If you're wondering what are NMX tokens, click here to read our whitepaper. So here’s how you can go about claiming your NMX tokens! It is as simple as that! Once your friend verified their account, you will be allocated the NMX tokens. For every friend you refer, you will get 100 NMX tokens! OH! And did I forget to mention? There is no limit to the number of people you can refer! Which means you can keep earning NMX tokens just by referring more friends!